The River Thames is probably cleaner today than it has been for decades. Yet there is still much to do. THE River Thames is probably cleaner today than it has been for decades. Yes, there is still much to do – we still suffer from regular contamination from sewage outfalls and occasional industrial spillages – but the water quality has certainly improved dramatically in recent years witnessed by the fact that the number of species of fish has risen and aquatic birds are abundant.. But it’s not only the quality of the water that plays a significant role in the beauty of the river – it’s the bizarre and selfish habit of human beings who continually throw their rubbish into the water that has a major impact on the eco-system and on the look of the river. Plastic bags, bottles, sweet wrappers, crisp packets, clothes, books, toys – you name it, the list of detritus in the Thames is almost endless. Not to mention shopping trolleys, old bicycles, car parts, televisions and virtually every kind of domestic appliance you can think of. It really does beggar belief sometimes. So thank Heavens we have the Thames21 charity, which regularly organises clean-ups and litter picks using thousands of willing volunteers to try to stem the tide (if you’ll forgive the expression) of rubbish dumping. John Hirsh, the chairman of the Lower Sunbury Residents’ Association (LoSRA) wrote to me recently about the charity’s activities. He said: “I don’t know whether you are aware of the sterling work being carried out by volunteers working alongside Thames21. “I happened to be free on a Sunday morning recently when Desborough Island was scheduled for a clean up. With other volunteers, we filled 15 large black bags of detritus (fishing tackle, bottles, cans, polystyrene packaging and all sorts of other litter besides). “This bespoiling of the banks was all the more evident after the high water mark left by recent flood surges. You bet, John, I’m only too happy to oblige. I know Thame21 really well – I’ve covered a lot of the work done by their Hillingdon officer, Billy Coburn, who has carried out an exceptional job leading clean-ups and educational events on the Grand Union Canal and I know just how valuable their work is. 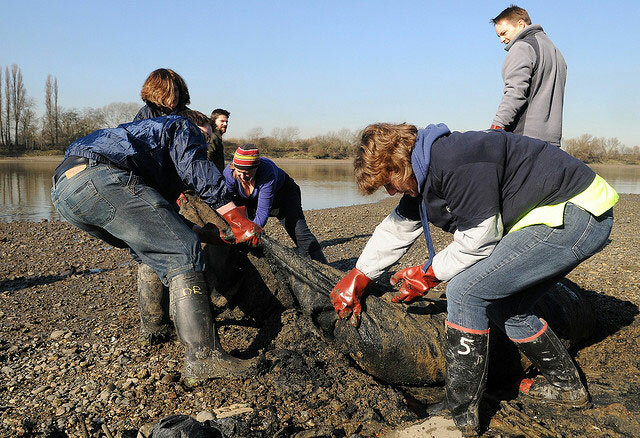 Thames21 developed from a partnership programme supported by Keep Britain Tidy, the Port of London Authority, the Environment Agency, Thames Water, British Waterways, The Corporation of London and 19 local authorities. The charity is now independent, and is funded by a wide variety of charitable trusts, companies and public funding. Although initially, its operations were directed mainly at the waters of the tidal Thames, it now does great work throughout our area and on many of the tributaries of the river. If you have a reasonable level of fitness, care about our beautiful river and want to do something positive to continue to improve the Thames and its surroundings so that everyone can enjoy them, why not come along to one of the forthcoming events listed below. You’ll have a great (if somewhat mucky) time and make friends with others who feel as you do. If you’d like to know more about Thames21, visit the charity’s website.